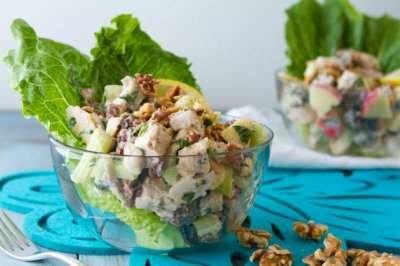 Apple chunks, juicy raisins, and organic roasted chicken make up this delicious salad, all tossed in a lemon and honey goat yogurt sauce. Cover a baking sheet with parchment paper or silicon baking mat. Place chicken breasts on prepared sheet, dust with salt and pepper, and bake for 30-35 minutes, or until internal temperature reaches 180F. Once complete, set aside to cool. Spread the nuts on a baking sheet and toast in the oven for 6-8 minutes. Set aside. Whisk all sauce ingredients together in a large bowl. 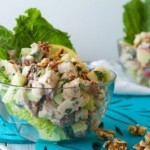 Add salad ingredients – walnuts, apple, celery, and raisins. Toss to combine. Serve over top of a bed of romaine leaves. To enjoy, rip pieces of romaine off from bowl and fill with chicken salad for mini salad wraps with each bite!